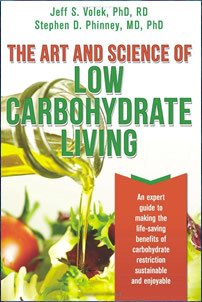 The Art and Science of Low Carbohydrate Living is written by Jeff Volek, an exercise physiologist and Steve Phinney, a physician-scientist who specializes in diet, exercise, fatty acids, and inflammation. Together these authors have published over two hundred research papers about the Low Carb Diet. This book is a guide for following a low carbohydrate diet as a lifestyle and was written with health care professionals in mind, although it will appeal to anyone who wants to understand more about this approach to eating. The purpose of the book is to explain the scientific evidence in support of low carbohydrate diets and to help dieters to adjust the diet so that it is suitable for long-term use. The authors outline three keys to success on this program. Safety: emphasizes formulating a low carbohydrate diet for optimum safety and function so that long-term health and well being are improved. Individual specificity: every human being is unique and may require a slight adjustment in the program according to their needs. Sustainability: addresses the various aspects of maintaining the diet as one component of a healthy lifestyle. The authors highlight the fact that it is vitally important to include an adequate amount of fat in the diet, to be able to maintain this way of eating as a lifestyle. Dieters are encouraged to let go of their fear of eating fat and to enjoy foods like cream, cheese, olive oil and nuts. There is also a recipe section entitled “The Joy of Cooking (And Eating) Fat”. An entire chapter in Low Carb Living is devoted to the treatment of Type 2 diabetes, explaining how this relates to the scientific concept of carbohydrate intolerance. Also included is information on the use of Ketogenic Diets for the management of seizure disorders. Egg, fish, meat, poultry, cheese, berries, spinach, asparagus, broccoli, cauliflower, kale, peppers, mushrooms, olives, sun-dried tomato, basil, garlic, walnuts, macadamias, seeds, avocado, whey protein, cream, butter, olive oil, xylitol. The authors explain how a low carbohydrate diet can affect exercise performance and body composition. They recommend waiting two weeks after starting a low carb diet before commencing with an exercise program to give the body time to adapt to the changes in fuel supply. The authors don’t prescribe a specific exercise plan in low carb living, but advise readers that exercise is best regarded as a tool for wellness, rather than weight loss. They also state that exercise can have negative effects in overweight individuals because it can cause damage to the joints. It is better to lose weight first and to focus on fitness later. The Art and Science of Low Carbohydrate Living: An Expert Guide to Making the Life-Saving Benefits of Carbohydrate Restriction Sustainable and Enjoyable retails at $29.95. Click Here to purchase this book at a discounted price. Principles of the diet are based on scientific research. Can assist with the management of obesity, diabetes and metabolic syndrome. Excellent guide for healthcare professionals who prescribe low carbohydrate diets for their patients. Advocates a customized approach to nutrition to suit the unique needs of the individual. Includes a seven-day meal plan and recipes. Involves restriction of carbohydrates and foods generally regarded as healthy such as whole grains, legumes and fruits. Some readers may find the book overly technical. Discourages overweight readers from exercising. The Art and Science of Low Carbohydrate Living offers readers detailed scientific information about the effects of a low carb diet, and advice on maintaining this way of eating as a long-term lifestyle. This book will appeal to health professionals who prescribe low carbohydrate diets to their patients, as well as dieters who want to understand the science as it relates to low carb living.